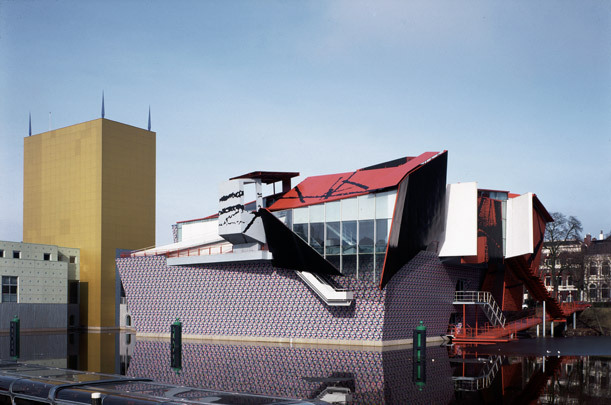 In the mid 1980s, the Groninger Museum could serious turn its thoughts to a new building thanks to a generous gift from the local gas company (Gasunie). After much political bantering it was decided to site it on an island to be built in the turning basin of the Verbindingskanaal, opposite the station. Gasunie expected its donation to produce an exemplary monument of international standing; the council desired tiptop architectural quality but nothing arresting enough to clash with the historical surroundings, plus a cycle route through from the station to the inner city; the locals really wanted nothing and the museum director Frans Haks everything providing the Italian designer Mendini was the architect. Hardly the most stable of situations in which to hone a design into shape. But then that wasn’t the idea: both Haks and Mendini feel that our age is marked by a heterogeneous totality of confronting aesthetics and that the museum is a reflection of this condition. Mendini’s design sports an ‘archaic symmetrical form’ consisting of several pavilions linked longitudinally. To flesh out his scheme, Mendini sought collaboration with an international coterie of architects, designers and artists, to bring to the homogeneous framework of the main statement a heterogeneous collage of architectural ideas. The museum breaks down into three parts linked at the lowest level by a central corridor. Mendini himself designed the central portion which includes the restaurant, library, offices and other facilities. Towering over the whole is the all-gold storeroom, the treasure house of the museum. The two remaining parts contain the museum galleries and each consists of two stacked pavilions with an architect apiece. Of the western portion, the basement clad in untreated red brick was designed by Michele de Lucchi for the archaeology and history section. Perched above it is a metal pillbox courtesy of Philippe Starck housing the applied art section. Its open interior can be subdivided using meandering curtains. The basement of the eastern part houses the modern art collection and is the work of Mendini himself. Originally, the rooftop pavilion for the old masters was to have been designed by the artist Frank Stella. When he backed down Coop Himmelblau were asked to fill the gap at short notice. An expressive explosion of steel plate and glass, their design was done intuitively with the aid of models; it is an attempt to realize ‘fluid’ architecture that is raw, sharp, vivacious. Remarkably, in view of the hectic building and design process and the deliberately provocative architecture, the hubbub died down immediately on delivery and it was as though the museum had been standing on this most logical of sites for centuries.